Colourful long-tail boats floating in transparent waters, surrounded by mountains, make Thailand a huge dream for authenticity seeking travellers. These scenes aren’t hard to find, and Thailand has way more to offer: temples, waterfalls, big cities, lagoons, magical islands, perfect beaches, scuba-diving… Add cheap prices, one of the best cuisines in the world, welcoming people, a solid backpacking infrastructure and you’ll understand why this is one of the most fascinating destinations in the world. I had the pleasure of living in and travelling through Thailand for almost two months and encountered so much more than I expected. My two big pieces of advice while travelling Thailand? Try to practice sustainable travel and embrace the backpacker style of travelling, which includes staying in many, many hostels where you will meet hundreds of like-minded people. 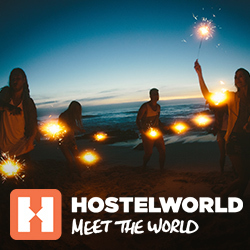 Hostelworld has more than a thousand registered hostels in Thailand, distributed in 49 cities, and around 225k reviews. The standard of hostel is also very high, so I had to be very picky here and take in to consideration not only the rate, features and location, but also the amount of reviews for each hostel. We have a whole article for the best hostels in Bangkok, so take a look when planning your stay in the capital. Thailand is the ultimate destination for the solo traveller. The country is full of solo travellers searching for new friends to share incredible experiences with. Almost every hostel is very sociable and a smiley “Hi! Where are you from?” can be expected at any attraction, restaurant and bus ride. Chosen as the ‘Best Hostel in Thailand’ and the ‘Best Extra-Large Hostel in the World’ at the 2018 Hoscars, Lub D Phuket Patong is really a one of a kind hostel. Located within a 3 minute walk to the beach, in the lively area of Patong, this hostel combines the great location with top-notch facilities – from the beds to the beautiful pool, and a friendly, cheerful atmosphere. There is no doubt that the solo traveller staying in Lub D Phuket Patong will have one of the best hostel experiences of their life. Showing off almost 6k reviews and a 9.2 rating, Nappark Hostel At Khao San was chosen as the ‘Most Popular Hostel in Bangkok’ at the 2018 Hoscars and any traveller who stays there will understand why. The hostel is close enough to Khao San Road, one of the most visited tourist streets in the world, but it doesn’t suffer from its noise, and is the perfect place to meet other travellers. And don’t worry about staying in the 22 bed dorm, they’ve still managed to make it spacious and comfortable. Chiang Mai is a city that makes you feel instantly welcome but staying at Stamps Backpackers will make that feeling even stronger. Offering activities every night, this hostel creates a family-like atmosphere that is emphasised by its amazing staff. The pod style beds are perfect for those looking for a bit of privacy. So, grab a Chang (Thai beer), sit at the bar and get ready for a memorable stay in Chiang Mai. The hostel’s slogan, “Once you come to Pak-Up, you’ll never want to Pak-Up”, couldn’t be more accurate. Every detail in this hostel is designed to make your stay stress free and full of great energy. Group activities, like the daily free BBQ or the weekly sunset kayaking, make it easy to make friends and to have a great time in Krabi. This is your opportunity to stay in a resort location for hostel prices! Chill Inn Beach is just a few steps from the white sand and an incredible light blue ocean. The vibe is also hostel like, with loads of opportunities to meet other travellers. Every night the hostel staff start an informal chat about the island to give tips and help the guests make plans. At night you can also join a transfer that the hostel organises to Chaweng Beach and enjoy one of the best party scenes in South East Asia. Does watching a movie with your feet in the sand and the ocean breeze touching your face sound impossible? Think twice! Thailand is the land where anything can happen and here there is a huge screen in front of the ocean. In addition to the movie nights, the Dancing Elephant Beach Club offers volleyball, themed dorms, parties with DJs and bonfire chilled nights. This hostel answers all your backpacker dreams! Few places in the world are as romantic as Thailand. The beaches, mountains, caves, lagoons, temples, ancient cities and waterfalls are stunning surroundings for couples in love – and so can be your hostel in Thailand! On one side, there’s a pier with the traditional little green islands view, on the other side there are lush green mountains. In the middle, your bed, either in a bamboo bungalow or a spacious dorm. If all that greatness isn’t enough, what about night swimming with bioluminescent plankton? A delicious family style dinner for a fair price? Kayaks to rent and traditional Thai massages? That’s all possible in The Bananas, making it an amazing choice for the couple looking for a romantic getaway, as well as for the laid-back solo backpacker. Get ready for some real cosiness! Hostel Lullaby is a relaxed hostel with cosy common areas and a green flowery garden. Private rooms and dorms are super comfortable and a free breakfast with scrambled eggs is offered every morning. The whole package is complete with super friendly staff and spotless cleanliness, as many guests pointed out in the reviews. What else can a backpacker couple ask for?! Address: 24 Soi 7 Prapokklao Rd. I love Bangkok with all my heart, but no one can deny that it’s an insanely busy city. With that in mind, the Yard Hostel is the place to stay if you feel that you might get overwhelmed by the Thai capital. The hostel’s neighbourhood is way more chill than the most touristic areas but very close to sky train, making it easy to explore the whole city. The bikes to rent, the big green backyard, the comfortable beds and the yoga classes will make your Bangkok time as relaxed as possible. The concept of a party hostel could have easily been created in Thailand (I’ll do some research!). As the country that receives thousands of backpackers all year long, the party never stops, and it can start just a few metres from your bed. Mad Monkey have hostels all over SEA, you cannot avoid this cheeky chain, and why would you want to? In Thailand alone, backpackers flock to this Bangkok hostel, but also to the Chiang Mai and Pai hostels. The chain is known, like the name implies, for its MAD parties, so get ready to experience all the craziness the Thai capital is known for. Meet other travellers in the swimming pool, in the common areas, in the bar, in the dorm. Everywhere in this hostel is a place to make friends and invite them to tag along for a great night out. Located just a few steps from the sand, Blanco Beach Bar will make the party island of Koh Phi Phi even more exciting. Every night the front of the hostel turns into a backpacker meeting point and games and shows take place. If you want to keep hanging with the amazing people you met in the hostel, it’s possible to join many daily activities or just chill in the colourful chairs by the beach. They also own, on the same island, the more chill hostel Blanco City Hostel. Are you in full Thai party mode and don’t want to relax in the more chilled city of Chiang Mai? If that’s a huge YES, then Bodega Chiang Mai Party Hostel & Bar is your perfect accommodation in this northern city. At night the hostel is transformed into a cheerful bar and everyone joins a pub crawl. So, visit the temples, explore the mountains and then head to your hostel to meet and party with travellers from all around the world. Slumber Party Krabi is THE best party hostel in the region and will upgrade your concept of a fun night out. The amount of exclamation marks in this customer review kind of says it all: “Honestly I can’t stress enough how much you need to get yourself to this hostel! I ended up staying an extra night because I found it hard to leave! Best staff I have ever came across!!!”. The party doesn’t need to end when you check-out though, as Slumber Party also has hostels in Koh Phangan, Ao Nang Beach and Phuket. Try them all, go on we challenge you! Phangan Arena is not lying when calls itself an arena. This hostel has so many activities that you’ll struggle to leave. You can be active in the swimming pool, playing volley ball and working out at the gym. Or chill, watching movies, playing video games and eating in the restaurant. Every night the hostel hosts one of the best warm-up parties on the whole island, so get ready! Need a break from sharing a dorm? Don’t worry, we have hostels with private rooms that will give you all the privacy you long for. These can also be a great (and cheap!) idea for people travelling in pairs or in groups. This is a container hostel Thai style: fun, functional, colourful and comfortable. Located in a more chilled area of busy Koh Samui and close to the airport, Us Hostel is a good place to meet people, relax by the pool and feel welcomed by the lovely staff. In walking distance from the hostel, you can reach a fishing village that is turned into a night market every Friday. Located right by the beach and with the option of private bungalows, Goodtime Beach Backpackers is a mixture of a party hostel with resort like accommodation. If you want to chill, you can, if you feel like partying, you also can. Enjoy the many facilities and activities in the hostel and then book tours around the island with the staff – all that combined with the possibility of meeting other fun travellers. This is the hostel for travellers that like to explore every amazing place nearby. The Luna Hostel is located in walking distance from the airport, and close to piers and bus stops, making it easy to explore the island and the surrounding paradise. The common areas and fun atmosphere complete the hostel, making a customer say: “I would rather stay here than a hotel even if I had more budget”. Bonus hostels. For all those who like good hostels. Located in the active area of Ratchathewi and close to a sky train station, Bed Station Hostel is an award winning, elegant and comfortable hostel made for the modern backpacker. Staying here, your day exploring Bangkok will start with a delicious free breakfast and end in a spacious cosy bed. The amazing staff make the hostel’s very high rating (from over 3k reviews) even higher. If you don’t want to shut the hostel door on Chiang Mai’s amazing green atmosphere, Haus Hostel is your place. With graceful decoration, free breakfast and a big rooftop, this hostel matches the city’s vibe and will make you feel welcomed from the moment you walk in. Reset Hostel is, as the name implies, the place to reset your energy while in Krabi. Located a few meters from a beautiful, not crowded beach, this hostel combines lovely staff and amazing fellow travellers to create a chilled and enjoyable atmosphere. The icing on top of the cake? Free snacks all day long! The blue of the pool almost gets mixed with the blue of the ocean in this beach front hostel that will make you want to move there as soon as you walk in. While staying in Tiki Tiki Beach Hostel, you can make friends in the pool, at the ping pong table, relaxing in a sun bed, watching a movie, renting a kayak… anywhere, anytime, always with a chilled atmosphere to help you. I hope this guide helped you to choose the best hostels for your trip. So, book your flights and hostels, pack your bags and head to Thailand. I give you my word, you won’t regret it for even a moment. Kapkunkaaa! The post The 21 Best Hostels in Thailand appeared first on Hostelworld Blog.